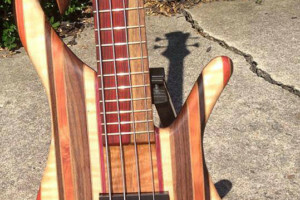 Beardly Customs luthier Rick Link sent us this example of his take on a rainbow style bass, and it looks like he knocked it out of the park. 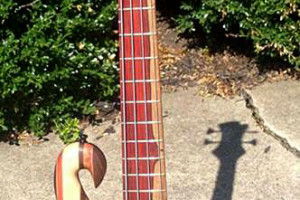 The bass is centered around its body, which has thirty separate pieces of wood to give a rainbow-like effect. Link used rosewood, purpleheart, wenge, flamed maple, redwood burl, blood wood, walnut, cocobolo, and walnut and maple veneers for a fantastic aesthetic. 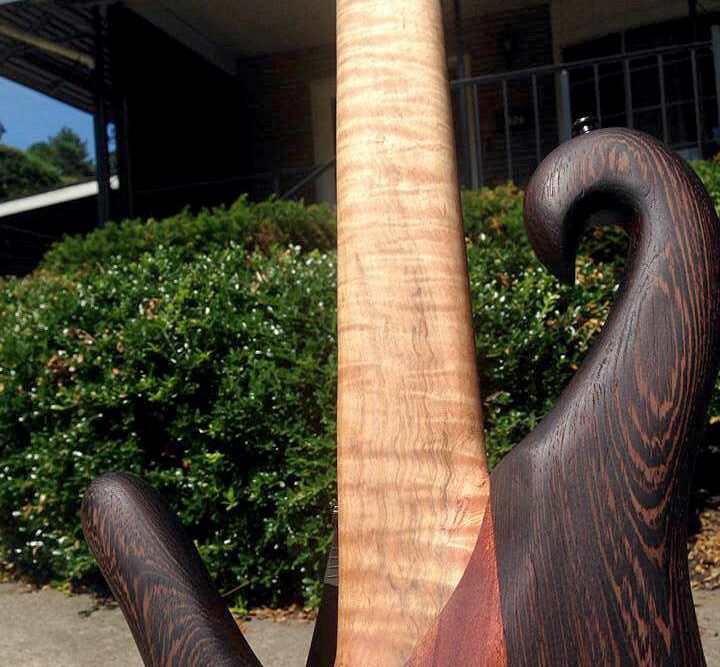 The bass’s neck is a single piece of curly maple topped with a two-tone cocobolo fretboard. 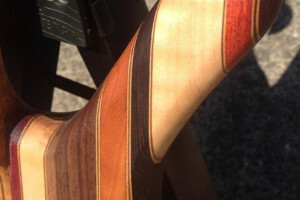 Following the theme of the body, the headstock is made of flamed maple, purpleheart, and wenge with walnut/maple/walnut veneers on its face. Link fitted the instrument with a pair of EMG Hzs wired to a single volume knob, a 3-way switch, and a coil tap switch for the middle pickup. Hardware includes a Kahler 7410 tremolo bridge and Hipshot Ultralite tuners. 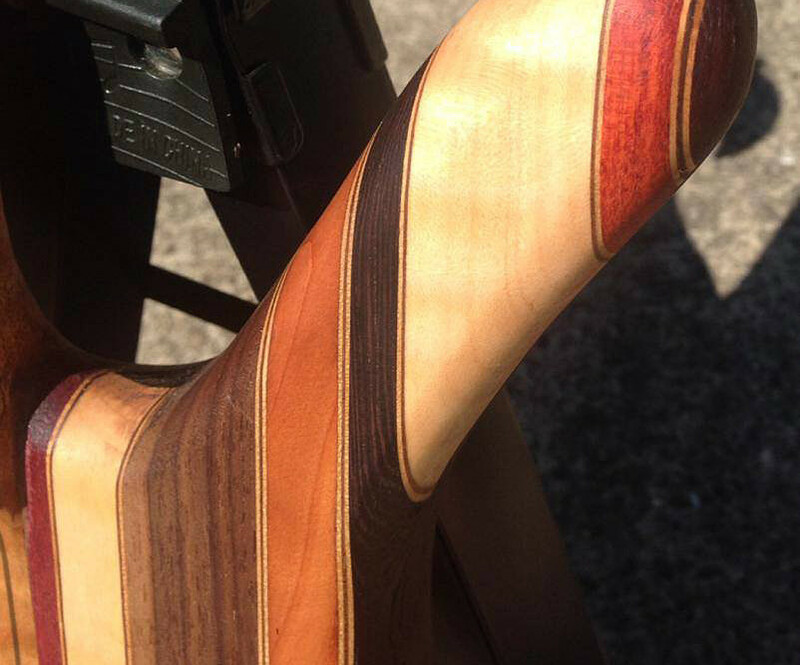 Make sure to check out the Beardly Customs Facebook page for build photos. Makes bass in a highly complicated, expensive way => uses most expensive hardware, buying kahler trems, and hipshot hardware… Then proceeds to put EMG Hz pickups in said bass… just… what? Yeah you’re right on that issue too. The pickups are nothing to write home about. 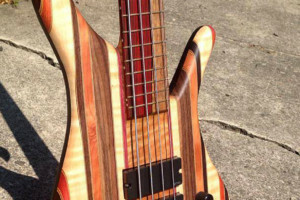 If they wanted to go passive they could have gone with Nordstrand or Bartolini, Also Aero and Haussel make some fine handcrafted passive pickups. 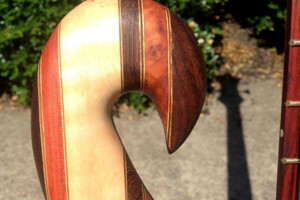 Both even have wood covered options to compliment this instrument. I put HZs in because those are my go to pickups. 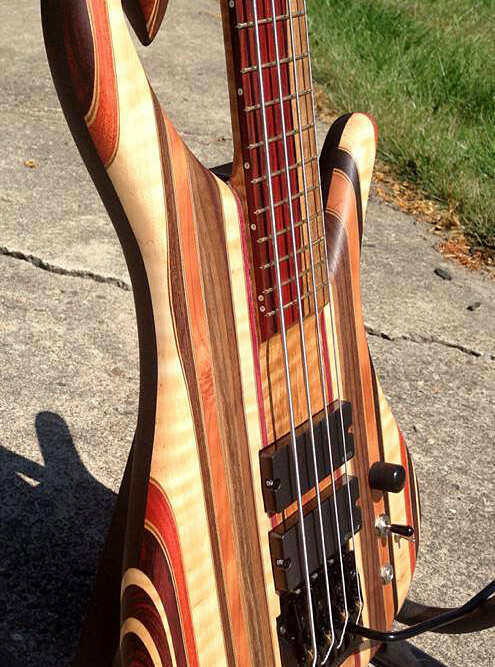 I am no fan of putting active anything in any of my personal basses. I put whatever anyone wants in their instrument, since this is mine it got what i like. Rick always go with what you like! These other guys haven’t realized yet that there own personal preferences aren’t necessarily right for everybody. Not a damn thing wrong with the HZs, they are a high quality pickup, not for everybody, but neither are Barts or Nords (also high quality pickups, just more “in fashion”). 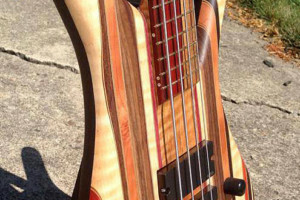 It should also be noted that most pickups can be modified to have wood covers, clearly Rick’s personal preference was to not have that done on his bass. 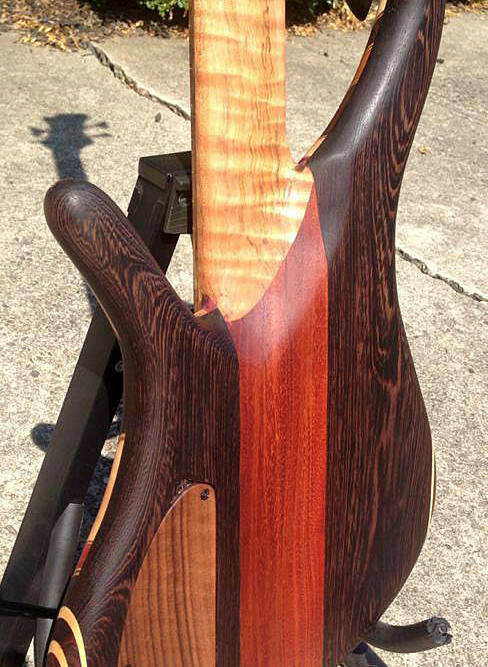 Beautiful bass, but with that many body laminates, I would have not expected a one piece neck. Since this a custom I’m sure this can be remedied. 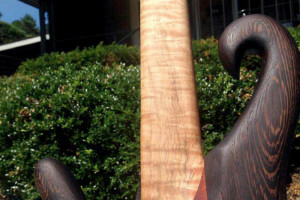 One piece is the realm of mass produced instruments. Otherwise I think this is a fine instrument. He was making a cutting board and changed his mind mid project. 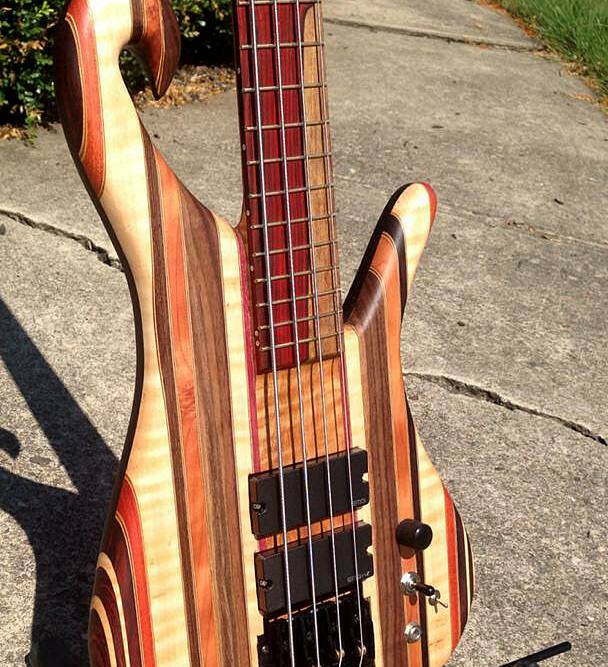 looks almost identical to carl thompson bass. why? do they all look like that? Don’t really like this one. The aesthetics are not balanced well and the black hardware doesn’t complement the overall finish. 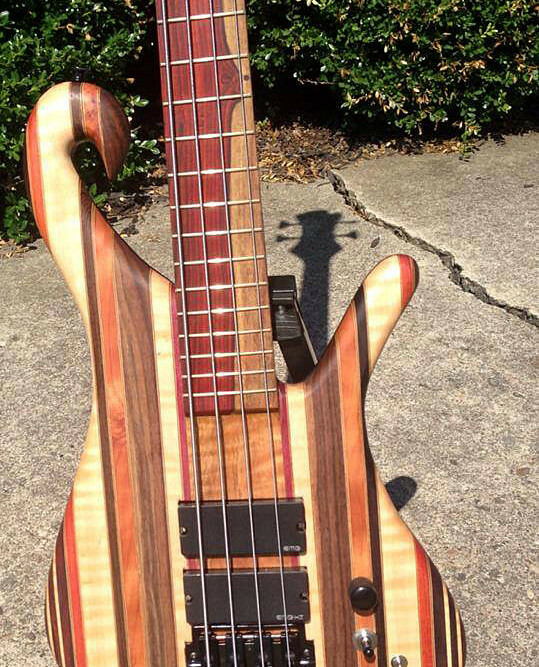 Who knows, might still be a good sounding bass though. 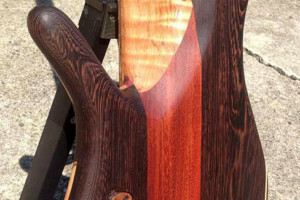 For me the go-to customs are made by either Mayones or Sandberg. Got one Mayo and another one coming up. Superb quality and not too overpriced.